A piece of advice that spans generations and facets of life is to learn from any and all people and situations possible. Currently, we are in the midst of a contentious presidential race between two candidates who, according to the news media, are the most hated two candidates certainly in recent memory and perhaps ever. Because the two candidates are so disrespected, they are a good test of the advice that we can learn from everyone. We are going to examine each candidate to see what he or she has said that is insightful. Last week, we looked at the words of Hillary Clinton. This week, we'll look at the words of Donald Trump. "Experience taught me a few things. . . . [S]ometimes your best investments are the ones you don't make." If you are in business long enough, you will experience a downturn in the economy. Adjustments in your practice will help you get through the tough times and be stronger in the end. The fact that Trump said this to someone is not the behavior that you want to model, but you should learn from what he said: your hygiene is important when you are in a service business and have to interact with people. 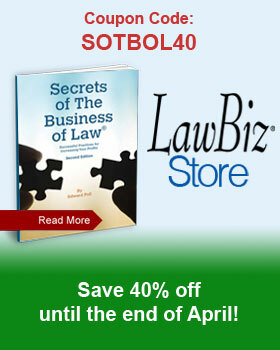 It may sound crass to talk about finances and the bottom line, but law is a business. You need to have a financial plan and stick with it. If the new technology does not promise a good return on your investment, for example, then steer clear of it.